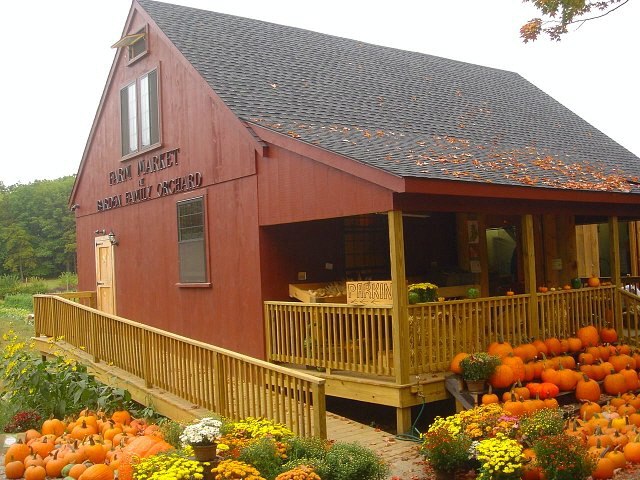 Visit our very own farm market! *Please note that “pick-your-own” ends 30 minutes before our store closes. Visit our Pick Your Own page for more information. Our Farm market is full of our own tasty fruit and home grown vegetables. Please see our crop season chart below for availability. Raspberries & Blackberries can be available already-picked upon request. Please call ahead at least 24 hours in advance: 401-934-1413. We also have delicious jams, salsa, local honey, and local cheese. Come for a little while or an afternoon. If you can’t get out to our farm in North Scituate, please visit us at your nearby farmers’ market. Sweet Apple Cider – fresh pressed right on the farm! Questions? Call ahead (401) 934-1413 or check our Facebook page for specific opening dates and details on crop availability.